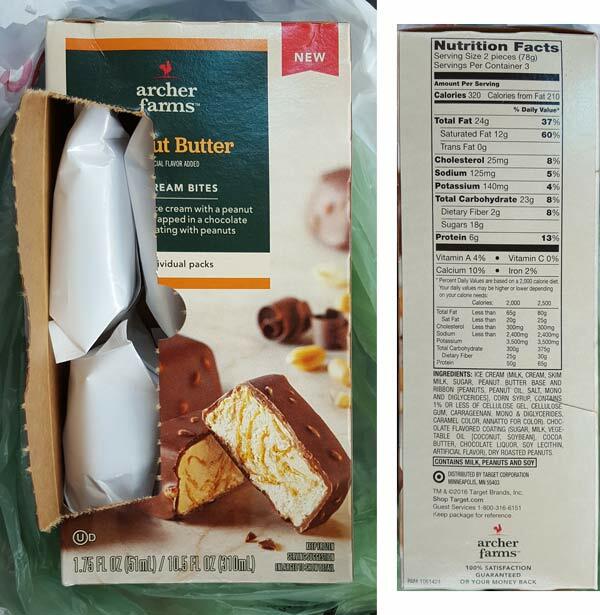 I take pictures before digging in and I see that this is billed as two ice cream bites per serving (so three servings per box). To be "good", I will eat one now and one in about an hour or so. Yeah, that's four bites at best. Two bites is tempting. One bite is risky. note 2: how tempting is it to eat the whole bag of snack size Take 5s? Initial impressions: The shell exploded on impact. I didn't drop anything but it was close. As you apply a little more pressure to keep it in one piece, the shell starts to melt to your fingers (so you might want to leave it in the wrapper when you start to eat it). 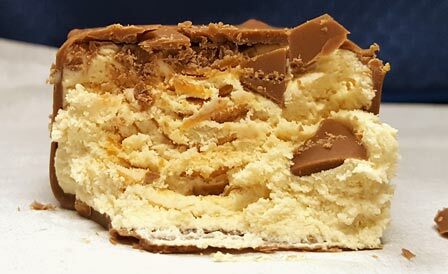 It's hard to see, but there are several very thin layers of peanut butter in there. The flavor is pretty good but there seems to be a little something missing. It's just a little less flavor than you might expect. I'm not sure if it needs a little more peanut butter or a little more salt, but it's decent. Overall it is reminiscent of a Snickers ice cream bar but the aftertaste is a little odd. There are peanut chunks in the mix but it's not like you get a blast of fresh peanut at any point, there's just too many other things going on. Secondary impressions (a few hours later): Despite cracking, the thick shell is fun and reminds me of a time when klondike bars were still awesome. 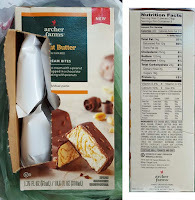 I would like the peanut butter ice cream to have a bit more of a pb punch, but it's still enjoyable because of the fun that is peanut butter and chocolate. The ice cream has enough density to make you feel like it's a fairly hefty treat plus it's not really gummy (something we see way too often nowadays). I'm definitely glad I picked these up and I think I started with the right flavor. I'll have no problem finishing the box. The biggest question is just a matter of how much I space out their devouring. On Second Scoop: The more I eat these, the more I like them. The biggest win for me is the overall crunch factor. I'm getting the hang of working my way through the thick shell without making a mess and I'm always up for lots of added texture. I still think the flavor is a little off. It's more noticeable in the aftertaste than during the actual devouring of the treat, but it's there. But wait, sip of water and it's gone... wait, is that cheating? Anyway, the moral of the story is that these are definitely worth a try. 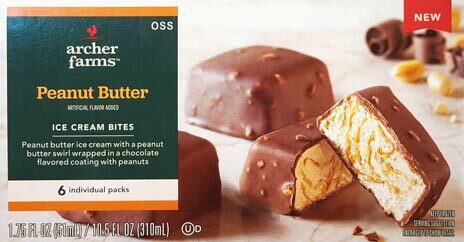 $3.99 seems like a lot of money for only six mini bites but that's just my opinion. This reminds me of Dibs. Are those even still a thing? (quick Google check) They are and depressingly there is only one flavor. Looks like they basically got discontinued. My childhood and dreams are crushed. I've tried the raspberry and the turtle. I thought they were okay, but they didn't wow me. I think the issue for me was the quality of the chocolate coating. It tasted like cheap chocolate to me.